It is not clearly recorded when the Clay Center Street Department was officially established but it is estimated that it was around 1875, nearly the same time the city was established. According to the latest census, the city of Clay Center has a population of 4300 and covers approximately 3.08 square miles. Street surfaces within the city limits are largely asphalt, but also include a small percentage of concrete surfaces and gravel surfaces. 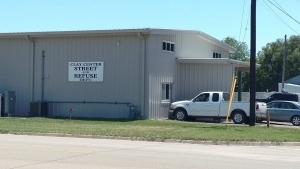 The Clay Center Street Department has the duty to maintain the driving surfaces, drainage structures, curb and gutter systems, and signs and all street markings of all the streets and alleys. This responsibility also includes snow removal operations, sweeping of the streets, and maintaining drainage ditches. The Street Department has seven employees to accomplish these tasks that include: Street Commissioner, Ken Shivers; Foreman, Shon Bloomdahl; Operators, Robert Crawford, Anthony Sisk, James Unruh and Dana Bergsten. The Street Department also has charge of the Refuse and Recycle collection. There are approximately 1900 households that get weekly refuse collection service in addition to a curb side recycle collection service. The Street Department assists other departments in the maintenance of a city wide composting and brush disposal site. The Refuse Department includes Nathan Affolter and Matthew Lips.